Years ago adding a deck or patio to your grassy yard was enough. Today families are adding levels to their decks, using pavers, stone walkways, shade-giving pergolas, covered living areas, outdoor kitchens and fireplaces. 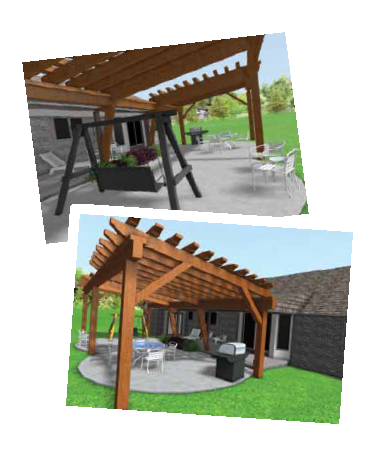 Even in Michigan people are extending the use of their yard with these customized outdoor living spaces. Start by thinking about how you want to utilize your yard. Just like inside your home, you have to plan out your outdoor space. Jason Arnott, owner of Earth Environments in Romeo, says creating multiple spaces in your yard will actually make it look and feel bigger. “By utilizing the whole yard, you create interest and bring function to open space,” Arnott said. Believe it or not hiring a landscape professional can be an upfront cost that ultimately saves you a lot of time and layout hassles down the road, potentially saving you money as well. “A good design and layout makes all the difference to ensure overall good balance and flow in the layout of a backyard,” Martindale said. Bethany DeCoopman at United Lawnscape in Washington Township has designers working with homeowners all winter long since there is a fair amount of planning that needs to take place before a landscape can be installed. “We cannot stress enough the importance of a professional landscape design. Far too often, homeowners skip this step, which leads to costly fixes down the road.” A professional consultation and design will ensure that the look and feel of a yard is pleasing but also that its functionality is correct. DeCoopman warns of common problems homeowners face when going it alone – improper grading; improper use of plant material; irrigation systems not set up properly; not consideringsoil type; not considering maintenance needs of the landscape. “When designing for our customers, we try to make the yard fit the desired lifestyle of the customer. Using creativity and spatial planning, we strive to transform yards into usable outdoor living spaces that our customers can enjoy for years to come,” DeCoopman said. Beginning with the basic patio space for a dining area or lounging area, Arnott recommends using brick pavers giving a customized look with low maintenance. “They are built rugged to withstand the weather, traffic and will last a long time. Compared to stamped concrete which is a cheaper route, there isn’t a bad choice in the different varieties of brick pavers,” Arnott said. If you’re on a budget keeping the paver design simple and on one level will help compared to different levels and complicated patterns. If you’re budget allows, by adding large stones for steps or built in flower boxes you will create more decorative spaces. Additional levels create more visual interest and even make a yard look bigger. Once you have the ground space utilized start thinking about your space above. “Pergolas are really multifunctional lattice spaces that can be used for shading, screening and giving a sense of space and atmosphere to an area,” Arnott said. They can be free standing or can attach to your home, or be out in the yard completely separate. Pergolas can hold vines, hanging baskets, bird houses and even TVs and ceiling fans. “We recommend using cedar as much as possible. We have even used some forest wood salvaged from the 1800s. You could also use red or white pine, but cedar gives you more longevity. Staining is recommended and there are lots of stain choices,” Arnott said. From outdoor kitchens, to fireplaces, and firepits adding the cozy feeling of a fire will extend the time you use your space into evenings and it will add length to your outdoor season. “Outdoor kitchens are a dream for most but due to the high cost to install them, few customers can afford to. Instead, we are consistently asked to design and construct designated areas for firepits or outdoor fireplaces,” said DeCoopman. There are plenty of options today for outdoor fire units in either wood burning or gas. Sizes vary as well and should be appropriate for the area you are working with. “Adding a fireplace to your outdoor living space is the final touch everyone should have,” Zendt said.